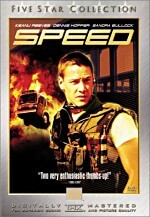 Steven Spielberg directs this high-velocity thriller about a motorist terrorized by an evil truck. Spielberg’s first full-length movie, Duel, helped jumpstart the director’s big-screen career, with a gripping, action-packed story hailed by critics as a film that “belongs on the classics shelf reserved for top suspensers” (Daily Variety). Dennis Weaver stars as the traveling salesman waging a desperate battle for survival after he is mysteriously singled out. Praised for its deft use of relentlessly mounting psychological tension, Duel features one of the most uniquely terrifying “characters” in movie history: a massive, roaring, 40-ton truck with sheer menace. A few years later, the action of Spielberg’s blockbuster hit Jaws would echo Duel’s tale of a lone hero in a heart-stopping fight to the finish against a monstrous, inhuman foe. Most people regard 1971’s Duel as the start of Steven Spielberg’s filmmaking career. This becomes open to debate due to the nature of the flick. He made it for ABC as a “Movie of the Week”, where it aired on November 13, 1971. However, Duel got theatrical screenings outside the US the following year, so it sort of qualifies as a big-screen movie. Whatever one wants to call it, Duel was a watershed work because it marked Spielberg as a talent with which to be reckoned. It tells a simple tale. As he drives through some remote California territory, Dave Mann (Dennis Weaver) gets stuck behind a slow-moving, fume-belching tanker truck. He politely and quickly passes this behemoth and goes on his way. However, apparently peeved at this move, the truck soon zooms past Dave and puts him back into the subordinate position. Dave again passes this guy, and after the trucker greets him with a loud horn blast, the pair seems to go on their way. But not for long. Dave stops for gas, and the truck pulls up right next to him. Nothing untoward occurs here, but the experience leaves Dave wary and jumpy. It doesn’t help that Dave’s already in a bad mood due to a continued spat with his wife (Jacqueline Scott). When Dave leaves the gas station, the trucker still awaits service, so it looks like their affairs reached an end. Unfortunately, that doesn’t prove true, as the tanker soon zooms up on Dave’s tail and passes him. Once in that position, the driver again slows and inconveniences Dave, and he maneuvers to make sure our protagonist can’t get around him. Dave slickly tears off onto a side road and zips past the truck, though, and seems to leave him in his dust. Unfortunately, this doesn’t prove true, as the truck soon reappears to menace Dave once more. The rest of the film follows the titular duel between the pair as Dave does his best to deal with the psychotic trucker and stay alive. Duel qualifies as a “it’s not the meat, it’s the motion” work. That plot offers a minimal piece. There’s very little to it, and you can forget about any form of real character development of story movement beyond the literal form of vehicular motion. It’s a guy in a truck who menaces a guy in a car - end of plot. And that’s perfectly all right with me, at least as executed in this splendidly executed effort. With hindsight, Duel doesn’t seem all that extraordinary when compared to the future pleasures Spielberg would create; as much as I like it, Duel doesn’t match up to classics like Jaws, Close Encounters, ET or Raiders of the Lost Ark. Nonetheless, it creates an involving tale that focuses strongly on both the psychological and physical terror through which the main character goes. Plenty of people rip off Hitchcock, but that doesn’t meant that their movies turn out well. Spielberg reveals those influences but never comes across as an imitator. Even at such an early stage, the director’s talents seemed abundantly clear, as he displayed the great sense of camera and staging ingenuity that would serve him so well. The movie flows well and rarely lets up on the audience. Spielberg always succeeded at placing the audience in his protagonist’s shoes, and that proves true here. 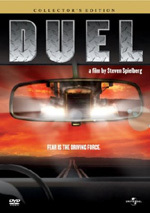 Duel seems particularly resonant because virtually every viewer can relate to situations in which they confronted aggressive drivers. Not too many of us have fought killer sharks or encountered aliens, but pushy truckers? Been there, done that! This allows Duel to become all the more powerful. 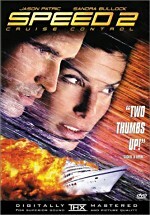 Note that the DVD presents the international version of Duel. The edition originally broadcast on ABC ran about 17 minutes shorter. Spielberg shot some additional footage for the international version to pad it out to feature film length for its overseas exhibition. Duel appears in an aspect ratio of 1.33:1 on this single-sided, double-layered DVD; due to those dimensions, the image has not been enhanced for 16X9 televisions. To be sure, Duel looked like a TV movie from 1971, but the DVD’s producers polished it up pretty well. For the most part, sharpness seemed positive. Occasionally I saw some mildly soft images, but those didn’t occur with any frequency. Most of the movie looked acceptably concise and well-defined. No jagged edges cropped up, but grilles caused some light shimmering, and I also noticed some light to moderate edge enhancement at times. Print flaws remained minimal. Minor grain cropped up at times, and I noticed the occasional speckle here or there. None of these caused problems, and the movie stayed clean the vast majority of the time. Colors were neither great nor poor. When we considered the arid setting of most of the movie, it didn’t lend itself to a dynamic palette, and rusty, faded tones dominated the tale. These were a bit bland but acceptably accurate and well-represented. As for blacks, these seemed pretty deep and firm, while the occasional low-light shots looked clean and smooth. You won’t use Duel as a demonstration image, but it was solid given its age and origins. For this DVD, we got brand-new audio options. Duel presented both Dolby Digital 5.1 and DTS 5.1 mixes. The two sounded identical to me, as I couldn’t discern any variations between them. I’d guess that Duel received the same treatment as the Jaws and Das Boot DVDs and used some audio not from the original stems. I felt that had to be the case for it seemed exceedingly unlikely that they’d be able to rejigger the old material and make it sound so good. Make no mistake; the quality of the audio here seemed pretty terrific. Some of the elements clearly came from the original recordings, as it was obvious we got the dialogue from the production. The lines occasionally sounded a little tinny, but they usually didn’t belie their age and seemed fairly natural and concise. I noticed no issues with intelligibility. Music came across well. Given the flick’s minimalist nature, it didn’t use a lot of score, but the parts we heard were pretty dynamic and lively. The music didn’t match up with modern efforts but it seemed strong for its era. Not surprisingly, the probably redone effects fared best. These consistently sounded vivid and vibrant, and they offered fine range and clarity. Bass response packed a good wallop when necessary, and with the depth of the truck-related noises, these made the flick all the more effective. While the soundfield didn’t go nuts, it very nicely broadened the material from its original one-channel origins. The soundscape established its ambitions right off the bat during the opening driving scenes, as they provided a good sense of the road. The more violent sequences proved exceedingly involving and active. The various elements zoomed around the spectrum well and made the material come to life. The surrounds offered a great deal of unique information and added measurably to the experience. 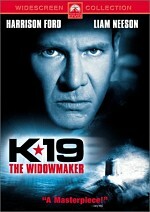 They bolstered the action sequences well and turned into dynamic partners in the mix. Overall, this was a solid track that earned an “B+“ since it seemed so much stronger than the average audio from the era. Though not stuffed with extras, Duel tosses out a few tasty morsels. We start with the most substantial, Steven Spielberg on Making Duel. This program runs 35-minutes and 41-seconds as we hear from the director. Spielberg chats about how he found the project and landed it, casting both humans and vehicles, studio pressures and his insistence on shooting on location, stunts and driving, planning, various trivia notes, and many tidbits about the shooting of the film like making slow-moving vehicles look faster. Spielberg discusses his nods to Hitchcock and that director’s influence on the movie, the pressures of the flick’s rapid post-production, sound design, music and reactions to the film. I still wish that Spielberg would do audio commentaries, but he makes this a very informative and engaging look at Duel. It’s a fine examination of both the movie and Spielberg’s earliest days as a filmmaker. Next we find Steven Spielberg and the Small Screen, a nine-minute and 28-second featurette. In this piece, Spielberg gets into the various programs he worked on for TV. He traces his path through that realm and relates his experiences. We also see clips from many of the shows. I’d love to get a compilation DVD with all the TV shows that Spielberg directed, but unless that happens someday, this featurette offers a nice take on Spielberg’s “lost” years, the material that most of us haven’t seen. The Photograph and Poster Gallery includes 21 images. These mix publicity shots from the movie and international posters from the realms in which Duel ran theatrically. In addition to a Trailer of unclear origins - it doesn’t seem clear where it ran - we locate two text features. The Cast and Filmmakers Bios presents entries for actors Dennis Weaver, Jacqueline Scott, Eddie Firestone and Lou Frizzell as well as Spielberg and Matheson. These vary in quality from passable (Weaver and Spielberg) to extremely perfunctory (the others). Lastly, the Production Notes also seem brief and fairly useless; they tell us very little about the film’s creation. Steven Spielberg’s earliest film - albeit one created for television - Duel holds up nicely more than 30 years after its initial release. Simple and taut, the movie presents a clear and gripping tale. The DVD offers pretty positive picture with excellent audio and a small but satisfying set of supplements. Spielberg buffs will clearly glom onto this DVD, and others should give it a look as well, for it provides a satisfying piece.